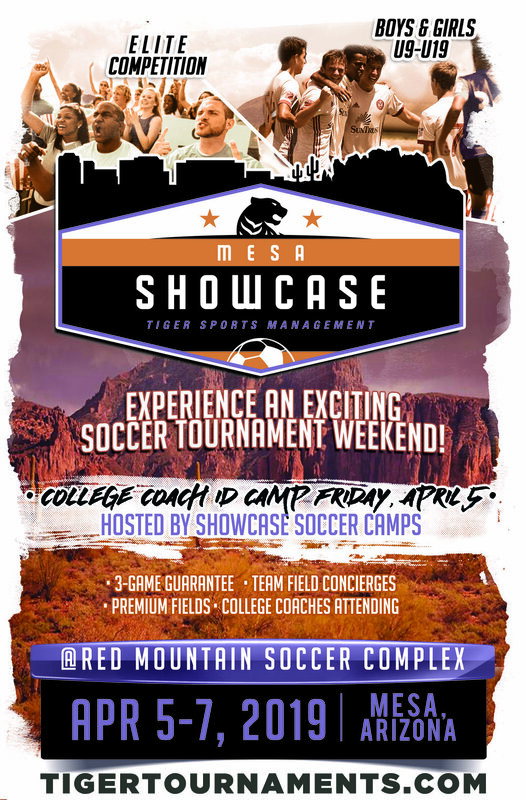 The Mesa Showcase will be held April 5-7, 2019 and is open to USYSA, US Club Soccer, Super Y League, and FIFA affiliated teams. It will be an exciting soccer tournament weekend hosting U9 through U19 boys and girls teams in the Gold, Silver, and Bronze Level Divisions. The Showcase will combine top-level competition with professional tournament organization – competitive bracketing, premium fields and top referees. All attending teams will be provided Home and Away Tents, Team Benches, Pro-Trainers, Refuel Stations, No Coaching Conflicts and a 3-Game Guarantee. The Mesa Showcase promises to be one of the best tournament experiences in the Country.